One minute, you’re driving home, butthe next, you’re handcuffed and under arrest for DUI and facing some serious penalties. A driving while under the influence arrest often represents an individual’s first involvement with the criminal justice system and experience with a DUI lawyer. Many of these individuals are good law-abiding citizens. Several didn’t realize that their blood alcohol concentration was too high, while others weren’t drinking at all. That’s right! While some cases involve illicit drugs, many more drivers are being arrested for a DUI after taking other their prescription medications like their doctor prescribed. A Pierce County DUI arrest can be a very embarrassing, scary and stressful experience. You may be facing the loss of your license, which could, in turn, result in the loss of your job and the inability to care for yourself, along with your family. And there’s also the sky-high insurance rates, the fees, and fines and there’s even the potential for jail time. If you’ve been arrested for DUI, Pierce County DUI defense lawyers with The Law Offices of Kevin Trombold, LLC our experts are here to assist. Our goal is to protect your interests, while striving to minimize the impact of this challenging experience. We handle all types of DUI cases, including those involving alcohol, illicit drugs, and prescription drugs. Our defense lawyers can also represent you in cases involving other types of charges, whether it’s a misdemeanor or a felony. 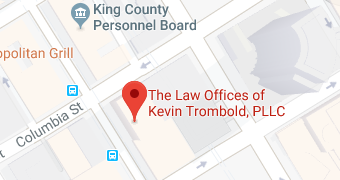 The Law Offices of Kevin Trombold, LLC is committed to you, our client. Our goal is to minimize any adverse impact on your life, including fines, penalties, loss of license and jail time. If you or a family member or friend has been arrested for DUI in Pierce County, please call The Law Offices of Kevin Trombold, LLC if you would like to arrange a confidential consultation at 206-382-9200. If you’ve been arrested for driving under the influence, you may have lots of questions and concerns. In fact, we’ve found that the lack of knowledge and uncertainty that many clients experience only adds to the distress that they experience. Therefore, our goal at The Law Offices of Kevin Trombold, LLC is to help alleviate some of your concerns, so our legal team has addressed some of the most commonly-asked questions surrounding this type of case. Washington State’s blood alcohol concentration (BAC) limit is .08% per 210 liters of breath. Therefore, if an adult driver over the age of 21 has a .08% BAC or higher, they may be subject to arrest. It’s important to note that there are circumstances where an individual with a lower BAC could be arrested. For instance, a driver who is younger than 21 must adhere to a legal limit of .02%, whereas commercial drivers must adhere to a limit of .04%. As the term “blood alcohol concentration” implies, this refers to alcohol consumption. The authorities administer different chemical testing for illicit drugs and prescription drugs. Additionally, drivers with an “excessive” blood alcohol concentration of .15% or higher are often subject to a more serious charge, which carries harsher penalties if convicted. How Do Washington’s DUI Per Se Laws Impact Drivers? In Washington state, the laws concerning driving under the influence are per se laws. This means that anyone who exceeds the BAC limit is subject to arrest, regardless of how they perform in field sobriety tests. Therefore, in theory, if a driver were to perform perfectly in their field sobriety tests, they could still be arrested if they have a BAC that exceeds the legal limit. Is Driving Under the Influence of Marijuana Grounds for Arrest in Washington State? Marijuana is now legal for recreational use in the State of Washington; however, just like alcohol, there will be limits to how much you can consume if you plan to drive. A driver is considered to be “under the influence” of marijuana if the THC content exceeds 5 nanograms per 1 milliliter of blood. When a driver refuses a chemical test, he or she could face a license suspension, with a timeframe of up to two years in addition to up to 364 days in jail, along with a fine of up to $5,000. It’s especially important to have an experienced attorney in this type of case. Our lawyers will seek to minimize any penalties or other adverse effects. One of the most common questions that we receive regards the potential DUI penalties. But there is no one-size-fits-all answer because the penalty varies dramatically depending upon factors such as the substance involved, BAC and chemical testing results, whether you have a prior DUI conviction and even whether there was a child in the car. DUI penalties can include fines, enrollment in a treatment program, license suspension or revocation, probation and jail time. Other consequences may include higher insurance premiums and fees associated with the installation and rental of an ignition interlock device. I Was Arrested for DUI After Taking My Prescription Medication. How Can This Happen? Unfortunately, Washington laws do allow police to arrest drivers who drive after taking certain prescription drugs – even with cases where the medication was taken precisely as directed by a physician. Individuals with a serious injury, chronic illness, and senior citizens tend to be targeted for this type of arrest. In short, if the police officer believes the driver may be impaired, this can serve as grounds for arrest. But since the case involved a prescription medication, and if it was taken as prescribed, it’s a point that can be used in your defense. Many drivers are understandably concerned about the status of their license, as a DUI conviction could lead to a license suspension of a minimum of 90 days, and up to a maximum of four years. Our Pierce County DUI attorneys will work hard in our efforts to help you maintain your driving privileges. The Department of Licensing (DOL) oversees your license and any penalties involving your license status. These are also known as administrative penalties. After a DUI arrest, you will typically be issued a notice of suspension. A license suspension usually goes into effect 60 days after your arrest. But you have an opportunity to file a request for an administrative hearing. The DOL charges a $375 fee that is non-refundable so you can request a hearing, but you may seek a fee waiver. At this DOL hearing, your attorney can provide information on your case, fighting to help clear you of any wrong-doing with the DOL. This may allow you to keep your license. Is There Any Way to Get a Restricted License? If the administrative hearing doesn’t end in your favor, you may be eligible to obtain a restricted driver’s license, allowing you to travel to your job, for example. Also known as an ignition interlock driver’s license, you will need to install and use an ignition interlock device. The device is affixed to the ignition, and it administers BAC testing before allowing you to operate the vehicle. Drivers are also required to get SR-22 insurance. Our DUI lawyers can guide you through the process of getting SR-22 insurance and an ignition interlock license. A DUI may leave you embarrassed, ashamed and concerned. You may face the loss of your license and even jail time – two penalties that can impact every aspect of your life and your family’s life too. It’s vital that you hand your case over to a knowledgeable DUI lawyer in Pierce County who can mount a strategy of defense to your case, increase your chances of seeing a positive outcome to your specific case. Our team is eager to help you put this challenging chapter behind you, allowing you to look to a future that will be filled with hope and optimism. Contact one of our DUI defense attorneys at The Law Offices of Kevin Trombold, LLC to go over your case, completely confidential. Call us at 206-382-9200.